The Holy Family Community of Pissy has only 15 years of existence. The School Complex Holy Family is a young, big and nice school, which is the fruit of solidarity of all the Provinces of the Institute to welcome the gift of the Third Millennium. 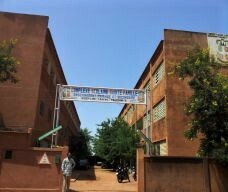 It is situated in Pissy, in sector 27, District 6 of Ouagadougou. It is a property of the Brothers of the Holy Family. It has an area of 6,312m2. It is a Catholic school. It is the work of all the Brothers of the Institute because its realization is the result of all the coordinated efforts of the Brothers of the Holy Family in the world. 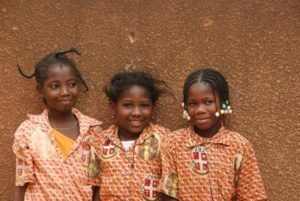 That is, in 2000, for the Centenary of the evangelization of Burkina Faso, the different Provinces of our Congregation wanted to express this historical event with a sign of support to Education. Thus our establishment is born in October 2001. The staff working in the School gets the inspiration from the Holy Family of Nazareth, since their daily actions are supported in the prayer, love and work. The family spirit is one of the characteristics of our school. The teachers strive daily to develop in the students the personal, community, spiritual, moral and intellectual dimension. The students receive, like in the other Centres of the Brothers of the Holy Family, a holistic formation which is essential for the construction of a responsible nation. Our Holy Family School Complex offers teaching in Primary and Secondary Education. This year it has 1,449 students distributed in 23 classrooms and directed by 67 teachers and non-staff members. Regarding the educational results, the Schools has always had a 100% in the Certificate of Primary Studies and maintains an 80% or 90% for the Secondary and Higher Secondary Education. In fact, the School registers 522 admission out of 524 in 10 years for Primary; 1,172 admissions out of 1,273 in 12 years for Secondary and 687 admissions out of 798 candidates in 13 years for Intermediate. This represents nearly 200 graduates per year. It was born under the shadow of the Holy Family School Complex on 13 October 2001. It is situated in the second floor of one of the three big buildings of the whole campus. 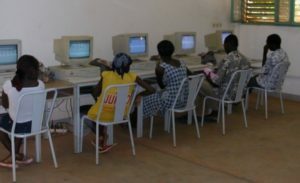 Its main mission is the management of the School Complex for the education of the youths, a shuttle for the construction of the country and the consolidation of the Kingdom of God. The first years, the Community welcomed the Brothers who were in charge of the Wend Manegda School, located 3 or 4 km from the place. 2. Brother Georges SONDO, Administrator of the Community, responsible for the Vocation, relations with the parish and in-charge of the liturgy and chants in the School. 3. 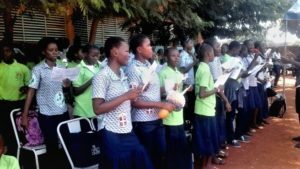 Brother Alphonse TANKOANO, General Coordinator of the School, support to the health: School – Community; in-charge of the youth movements and the cause of the Founder. 4. Brother Eustache NANA, Superior of the Community. In-charge of Diary, Anniversary of Events, Library of the Community. 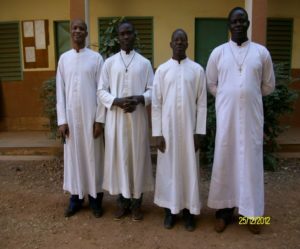 A member of the Community assures the national responsibilities of the Catholic organization of education; and another member participates in the formation of Postulants, Novices and Scholastics. 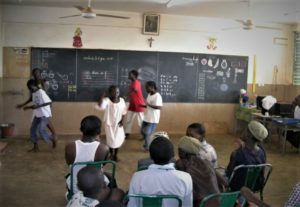 The Community responds to the requests of the young parish that has not yet the necessary structures, putting at its disposal some spaces for the catechesis, preparation for marriages, meetings and assemblies. Some Communities of Base also ask our premises for the meetings, assemblies, conferences and meetings of formation (preparation for Baptism, etc.). “In the family where the pot of fresh water is accessible and available for all is never empty. 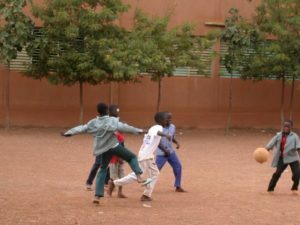 Only it is necessary to accept the joyful noise of the children and fill the pot continually” (Burkinabe proverb). An overcoming obstacle for the Taborinian charism.